If you’re not aware of Atlas Reactor yet, now is the time to familiarise yourself. A fusion of turn-based battles akin to XCOM, played 4v4 with unique ‘Freelancer’ characters like a MOBA, it genuinely feels like something new and exciting. 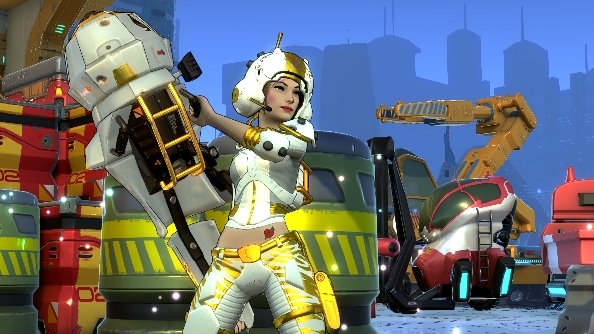 It goes into closed beta today, and with that upgrade in status comes Seasons: the system that will drive forward Atlas Reactor’s story and missions. Not in the Atlas Reactor closed beta? No worries, you can always play one of the best free PC games if you don’t fancy splashing the cash. Three months in length, each season is made up of a series of chapters that release every few weeks. These chapters provide a little narrative to progress the overarching Atlas Reactor story, but they primarily offer a variety of goals and challenges to work through (think ‘x amount of wins in a row’ fare). Completing contracts unlocks new chapters, while challenges are there to hand out chunky rewards. When creating the seasons system, developer Trion Worlds set out to make something that didn’t adhere to the moulds set by typical free-to-play, hero-focussed games. Rather than emphasising ranked competitive play as the way for players to progress, Atlas Reactor allows numerous approaches. That’s an important note: Atlas Reactor supports both solo and multiplayer, as well as co-op by teaming up with others to play against a gang of bots. 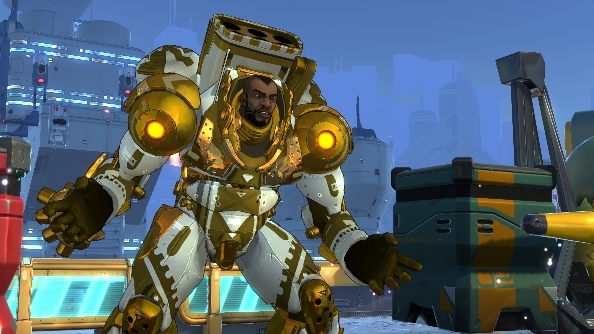 Akin to other free-to-play games you may have played, Atlas Reactor has progression levels for each individual character and the game as a whole. When your account hits level 10, seasons is opened up. And with it comes the steady drip feed of new content, not only in additional chapters, but loot and items. Many rewards are only available to win during a season, and come in a dizzying range; banners and titles, skins and styles for your characters, emojis to use in chat, and taunts. That last one is notably fun: available to be used twice per match, they swing the camera down from its birds-eye-view to show off a character as they strike a pose and shout a bit of banter across the battlefield. All rewards are found in Matrix treasure chests (dished out for every level you advance), or produced in the crafting system. While not a hugely in-depth feature, crafting allows you to recycle items you don’t require and produce new Matrix chests, which can then be opened up for more random rewards. No matter if you gained the raw materials through recycling, playing matches, or by purchasing increased levels, you’re always in with a chance of finding every type of reward inside a Matrix. Seasons aren’t all that’s fresh with the closed beta. A new Freelancer is joining the ranks: Elle. She’s a swift assassin with a plasma-powered shotgun, which can be fired by dragging a cone-shaped template over the battlefield. The template alters size and shape as you position it, allowing for a long range, narrow blast or a short, wide-angled spray. Elle has been designed to offer something a little different. 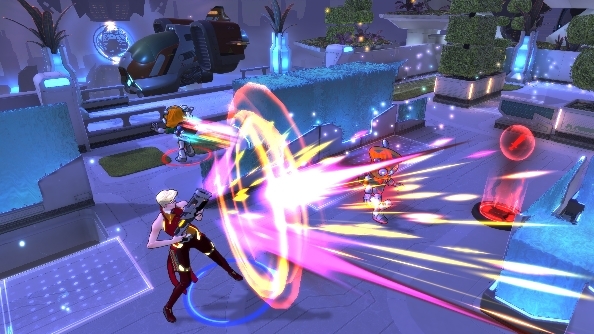 Atlas Reactor’s turns are broken down into discrete phases, one of which is the ‘dash’ phase. Allowing characters to jump out the way before other players launch their attacks, typically dash abilities can only be used once before requiring a recharge. Elle, on the other hand, can use it multiple times before a cooldown kicks in. 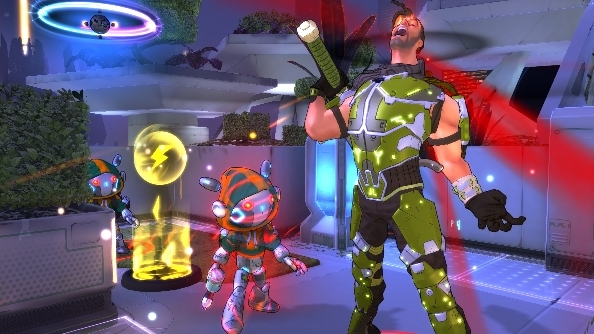 Atlas Reactor feels absolutely stuffed to the rafters with features. The combat is layer after layer of strategy, which when written down seems needlessly complicated, but in reality is slick, fluid and fun. The alpha proved that, and now the closed beta is here to prove that the meta game boasts the same kind of excitement, too. Should you wish to try it out for yourself, you should sign up for the Atlas Reactor closed beta.